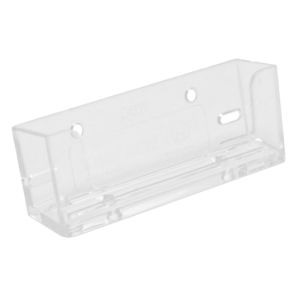 The Wall Mount Business Card Holder is a wall mount card holder used to display business cards, gift cards or coupon cards. This holder is versatile and affordable. 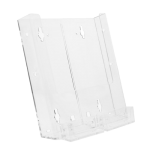 Add the Wall Mount Business Card Holder to the front of many of our brochure holders to enhance its versatility. 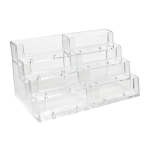 The Wall Mount Business Card Holder is one piece injected molded, offering a product with strength, clarity and value. The WBC is designed to attach to most of our brochure holders or used in a custom display. It can be attached to any surface to created a display of multiple cards. Display your gift cards, punch cards, coffee cards and business cards in gas stations, grocery stores, coffee shops, information centers or on billboards or real estate displays. Offer your customers the added bonus of a "grab & go" business card or gift card. 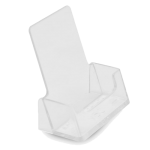 Attach this card holder to most of our models from the C4 to the 4C8.